The FinePix SL1000 is a very interesting bridge camera from Fujifilm that not only sports a 16 megapixel resolution, but also has a 3-inch tilting screen, 920K dot EVF, Full HD video, RAW format support and a teeth-aching 50x optical zoom. Other highlights include a 1cm Super Macro mode, a 3-level zoom switch, a flash hot-shoe, and a customisable Function button. How will this line-up of features square up in our test? 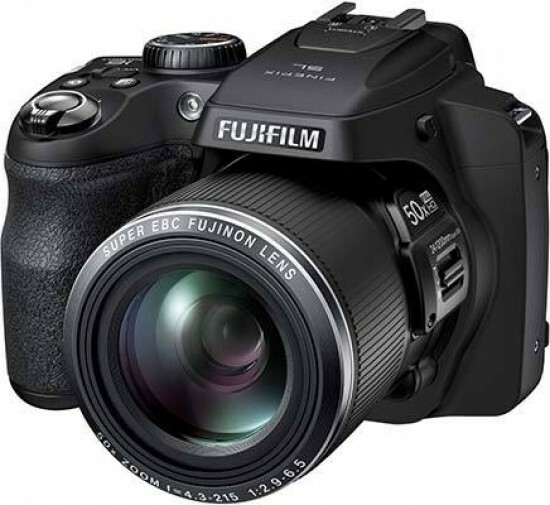 The Fujifilm FinePix SL1000 costs around £335 / $399.95 and is available in any colour as long as it's black. Around a month ago, we published our review of the Fujifilm FinePix SL240 which we found to be an interesting camera because of the features it has for the price. The brand new SL1000 also has interesting features, but has a £200 price increase on its little brother. What do you get for the extra £200? Well, for a start, externally there's the flip out LCD screen. The articulation isn't fully manoeuvrable, it won't twist from side to side. It does flip down and up, making macro or gig photography easier to shoot. Add a 50x optical zoom to that and you're going to be taking pictures of your favourite pop artists from seven rows back. The 50x optical zoom starts at 24mm (in 35mm terms) and finally stops at a nostril flaring 1200mm. 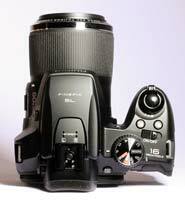 The rest of the Fujifilm FinePix SL1000 is set up for the more advanced user. Don't take that the wrong way, it certainly has functions for the novice, but this is a camera that will be favoured by someone looking to increase their knowledge in photography. Typical modes that the SL1000 has to offer for the learning photographer include manual controls on the command dial that sits on top of the body, an external flash hot-shoe and RAW recording. Let's take a closer look at these modes for a moment. The manual controls are the options on the command dial designated PASM. They stand for Program (camera controls shutter speed and aperture), Shutter priority (you control shutter speed, camera controls aperture), Aperture priority (as with Shutter priority, but reversed) and Manual (you control both Aperture and Shutter speed). The camera also controls the Aperture and Shutter speed in Auto mode, but in Program, the Main menu has more options open such as ISO and white-balance. Look on top of the Fujifilm FinePix SL1000 at the flash that sits over the lens and you'll see the hot-shoe just behind it. If you're unfamiliar with a hot-shoe, it's designed to attach external flash units to the camera. The centre metal point fires an electrical current that tells the flash that the camera is taking a picture and that it should make a bright light. The three smaller pins are what makes the flash “dedicated” to the camera. Using a dedicated flash will allow the two units to talk to each other. For example, the camera will tell the flash if the zoom is out and that it should increase power output. It will also communicate if a subject is nearby. The flash will then reduce output to avoid bleaching. RAW is a type of file that the Fujifilm FinePix SL1000 records in. When the camera takes a picture, no adjustments are made to the photograph. It's a raw file, hence the name. If you record in JPEG, the images are adjusted for colour saturation, contrast and sharpness then compressed to make them smaller by removing unnecessary data from the image. This frees up more space on the memory card to take more pictures. RAW files are therefore bigger and have no manipulation to them. They look flat and desaturated because the idea is that you do it all. To switch the SL1000 on, you need to slide the spring loaded power switch that's situated on the top plate just behind the grip. You can select whether you want to hold the camera out in front of you like a tourist, or use the viewfinder – which isn't that bad – like a professional. If you choose the latter, the camera is held firmer making pictures steadier at slower speeds. A zoom switch is located on the lens barrel to aid with zooming while using the EVF (Electronic View Finder). To switch between the two, a small button sits next to the EVF. If you use the screen, placing your eye to the EVF will switch the screen off and operate the EVF automatically. This is done by the small eye sensor next to the viewfinder hole. The main issue we have with an EVF (and this isn't singularly Fujifilm) is that the menus are brought up in it too. To use the menu effectively, it's best to switch to LCD first, which is kind of annoying if you're in a rush. The menus are laid out like any other Fujifilm camera and also in the same colours. It's interesting that Fujifilm have left their menus relatively untouched over the last few years. Other companies have gone for swish graphics and fancy lettering. The SL1000 menus are very easy to use and Fujifilm camera menus always have been. They have added a function menu to the SL1000, so the Main menu isn't alone. This allows a dedicated operation to be one touch away. You can set which function you'd like that to be such as ISO, Image size or quality, white-balance, FinePix colour, metering (photometry) and AF modes among others. The Fujifilm FinePix SL1000's start up time from cold is fast. We managed 1.6 seconds which included turning on the camera, focusing and taking a picture. A typical digital compact camera will do the same work in around 2.5 seconds. There are three continuous shooting modes that use a burst function. They're designated High, Medium and Low. They record a different amount of photographs within a similar time-frame (referred to as frames per second, or fps). Low mode will record 3fps, Medium will record 5fps while High will record 10fps. All will stop recording after 9 frames have been shot and they all record at full image size, which is great. Along with those, there's also a Best Frame Capture which will take a sequence of shots and the best result will be chosen from them and AE bracket. The playback button is situated on the back of the Fujifilm FinePix SL1000 between the dedicated video record button and the navigation pad. Images will be played full screen unless you use the zoom switch to either zoom in on details of the picture or, if you go wider, the images will tile so you can see more than one at a time. The Playback menu replaces the Main menu which is accessed when in recording mode. The Set-up menu is still available though. There are a few interesting features that Fujifilm cameras offer in the Playback menu. The first option the menu opens on is Photobook Assist. This mode allows you to create a list of images you'd like to use to create a photobook. You can create up to six books, which is pretty cool, especially if you're holidaying as you'll be able to designate images as you go. There's an option to search for images by specifying certain parameters such as date, face, favourites, type of data or upload mark. This latter option refers to the capability of allocating images to be uploaded to Facebook and videos to YouTube. There's also the option to upload to MyFinePix.com if you're a member. There are one or two editing modes such as red-eye removal, crop, resize and rotate. In the box, the camera comes with a lithium ion battery and charger, lens cap and neck strap. There's a USB cable for downloading data direct to a computer. There's also a brief manual to get you started, warranty booklet and a CD which holds the full manual and a basic editing suite called MyFinePix Studio Version 4.2. Conversion of RAW images is done by using Raw File Converter EX which is powered by Silkypix. The program is easy to use, simply open the folder or image you want, edit it in Converter EX or convert it to TIFF, which is a file type that an editing suite will recognise. The option to convert to JPEG is available, but there's no point in shooting RAW if you're going to convert it to JPEG.